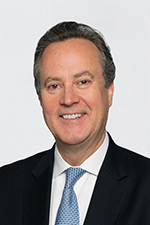 Del Norte graduate Doug Peterson, CEO of Standard and Poor’s Global, will be the featured speaker at the UNM Anderson School of Management McKinnon Distinguished CEO Lecture Series. He will discuss “The State of the Global Economy, Risks to Growth and a Path to a Greater Good.” The event will take place on April 3, 2019 at Hotel Albuquerque ballroom. The reception begins at 5:00 p.m., with the presentation starting at 5:55 p.m. The lecture is offered at no cost, however, seating is limited and reservations are required. Doug was born in Albuquerque and raised in Santa Fe before returning to Albuquerque to graduate from Del Norte High School. He earned his MBA from the Wharton School at the University of Pennsylvania and an undergraduate degree in mathematics and history from Claremont McKenna College. Doug was elected President and Chief Executive Officer of S&P Global, effective November 2013, and he joined the Company in September 2011 as President of Standard & Poor’s Rating Services. S&P Global is a leading provider of transparent and independent ratings, benchmarks, analytics and data to the capital and commodity markets worldwide. The Company’s divisions include S&P Global Ratings, S&P Global Market Intelligence, S&P Dow Jones Indices and S&P Global Platts. Previously, Doug was the Chief Operating Officer of Citibank, N.A., Citigroup’s principal banking entity that operates in more than 100 countries. He was with Citigroup for 26 years, during which time he led diversified businesses in investment and corporate banking, brokerage, asset management, private equity and retail banking. His prior roles include CEO of Citigroup Japan, Chief Auditor of Citigroup and Country Manager for Costa Rica and Uruguay. He is a Steward of the World Economic Forum (WEF) Shaping the Future of Long-Term Investing, Infrastructure and Development System and a member of WEF’s Financial Services Governors Community. He serves on the Advisory Boards of the Federal Deposit Insurance Corporation’s Systemic Resolution Advisory Committee, the US-China Business Council, the Partnership for New York City and the Kravis Leadership Institute, and the Boards of Trustees of Claremont McKenna College and the Paul Taylor Dance Company. The McKinnon Distinguished CEO Lecture Series was created in 2010 by Anderson alum Sonnet McKinnon and her husband D. Ian McKinnon as an expression of their commitment to UNM and the Anderson School. The annual endowed lecture series provides a glimpse into the minds of successful entrepreneurs and business leaders. Sonnet and Ian McKinnon are also the lead donors of the new McKinnon Center for Management building that opened at the Anderson School in 2018.